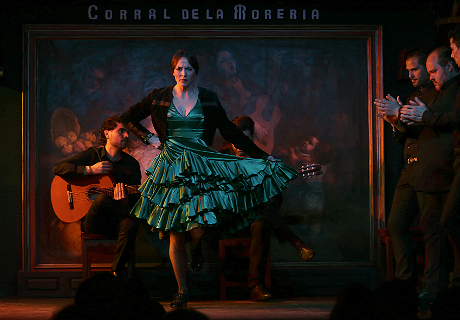 Corral de la Moreria may be the most famous tablao flamenco in the world and one of the most recognized flamenco establishments in Spain. In 2011 the establishment received a recommendation in the Michelin Guide for the fifth consecutive year, a testament to its continuous quality. Author Patricia Schultz, in her NY Times bestseller "1000 Places to See Before you Die", also listed Corral de la Moreria as one of Madrid's top 10 sights, ranked in the third place, along with the Museum of El Prado and the Royal Palace of Spain. The venue has also received the 2012 Traveller's Choice Award as well as the Madrid Tourism Award. 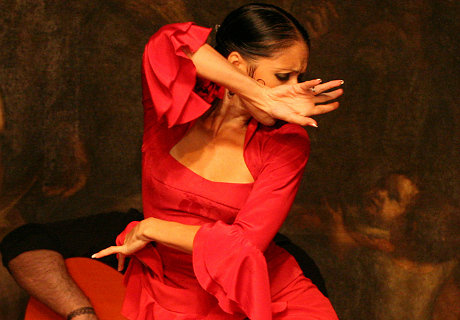 The artistic director of the tablao, Blanca del Rey, has received the National Flamenco Award. 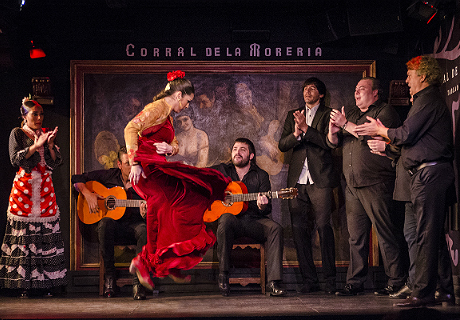 Finally, during the Festival Internacional de la Minas, one of Spain's most important flamenco festivals, Corral de la Moreria received the prize for the "Best Flamenco Tablao in the World". National leading artists of flamenco perform every night and of course the excellence in service, with a warm and personalized hospitality. Corral de la Moreria is located in the center of Madrid, very close to the Royal Palace. The tablao was founded by Manuel del Rey in 1956, making it one of the oldest, continuously run flamenco establishments in the country. 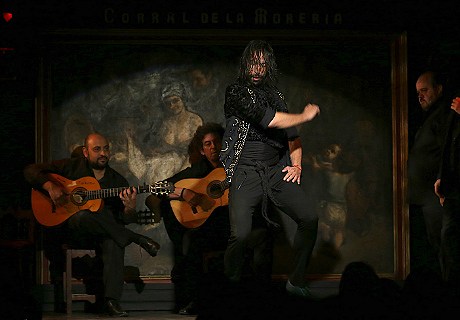 Over the years the establishment has featured a long list of famous flamenco artists such as La Chunga, Isabel Pantoja, María Albaicín, Pastora Imperio, Mario Maya, El Güito, Antonio Gades, Manuela Vargas, Lucero Tena and Blanca del Rey. The ambience is historic, and the decoration features items and architectural details from the 18th and 19th centuries, creating a traditional atmosphere typical of the oldest tablaos. 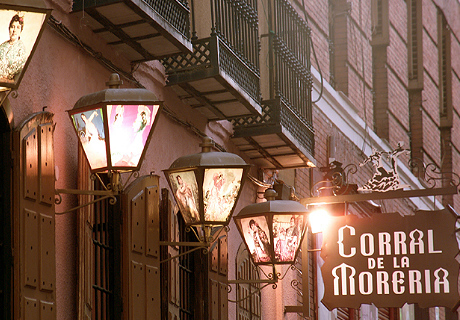 The Corral de la Morería has 56 years of history, and is considered the "Flamenco's Cathedral" around the world, often visited by Kings, Presidents and Celebrities from all over the world when they visit Madrid. 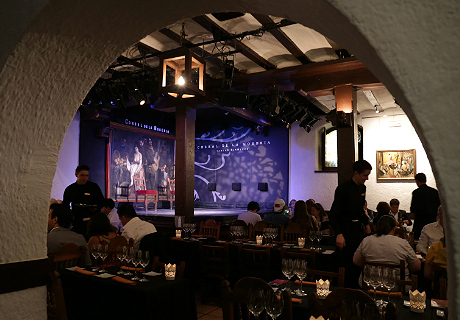 Corral de la Moreria features two flamenco shows every night, each lasting approximately an hour and ten minutes and featuring 11 performers. The establishment offers a complete dinner menu, as well as tapas, full bar service and a well rounded wine list. The kitchen offers a wide selection of traditional Spanish dishes, including Artisan Mi-Cuit Foie Gras over Cured Iberian Acorn-fed Ham Carpaccio, Sautéed Lobster, Veal Sirloin with Foie Gras and Potato Pastry au Gratin, Mango and Raspberries Sorbet with Orange Juice, Tomato Marmalade and Crystalised Basil, and more.